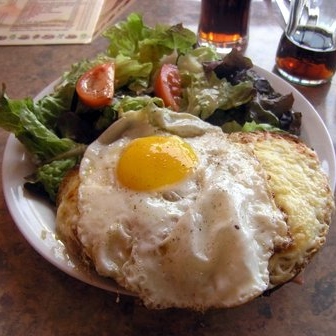 The Croque-Monsieur is one of France’s iconic food staples. On paper, the combination of ham, cheese, mustard and bechamel looks deceptively simple; but judging by the nasty versions I have had throughout the years, it is possible to mess-up this tasty Gallic classic! Spread the four halves of bread with half the butter and put on a table with greased side down. Melt the remaining butter in a skillet over medium heat and add the flour, salt and pepper. Stir until well blended, then slowly add the milk until the mixture becomes smooth and thick enough to spread. Remove pan from heat and mix with egg yolk and grated cheese. Then whisk the sauce until all the cheese has melted. 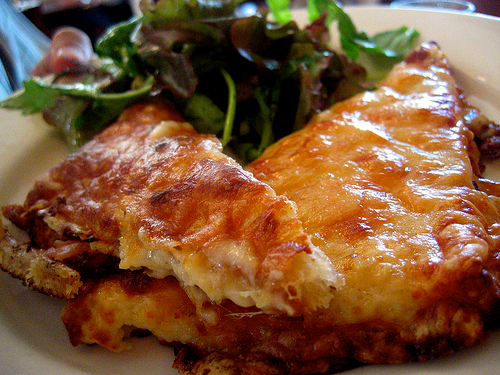 Spread cheese mixture on both sides of the bread is not buttered and sprinkle with half the Parmesan. Fold 2 slices of ham and put in a covered slices of cheese, repeat with remaining slices of ham and slices of bread spread with remaining cheese. Take the remaining slices of bread and put one in each of the slices covered with ham and cheese. Press lightly. Heat a grill and cook the sandwiches over medium heat for 3 minutes each side until golden and crisp. Sprinkle the rest of the Parmesan on top and leave on grill for another 2 minutes. Remove from grill, cut diagonally (remove the edges if desired) and serve immediately. It seems that in London, not all ‘French’ restaurants and cafés have mastered the art of croque-monsieur making or understand the difference between a toasted sandwich and a croque-monsieur. So where should you go or not go if you are looking for the perfect croquet-monsieur or even a croque-madame - a croque-monsieur with an egg on top (see what they did there? Cheeky French!)? After having eaten my way through quite a fair duds, the place I would nominate for a perfect "croque" is the The Côte Brasserie chain. "A chain? Surely not!" and I admit I was sceptical at first, but for all the things they don't do that well, this is one little dish they can churn out perfectly everytime. I was extremely impressed by the quality of the ingredients used. The cooking ensured that it was not too dry and the cheese was softly melted on top. And of course, the perfect amount of obligatory mustard that brought the croque-monsieur to life without overwhelming the other flavours. Absolutely yummy! As a Parisienne, it made me feel as if I were back on home-turf as I eat it. And, as an added bonus, you can now find one of their restaurants in practically every area of London: perfect for that mid-morning craving! There was no lovely melted cheese in sight: a sorry-looking piece of ham slapped between two slices of bread, with a swipe of supposed "bechamel" to lubricate. The whole thing had then been put in a sandwich press (sacrilège!) 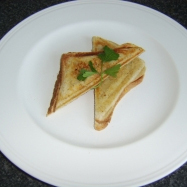 and had come out looking like a bog-standard toasty, though some effort had been made to "elevate" the dish with a few tired salad leaves and a plastic pot of mustard dressing. It would appear that the owner of the Belleville Café on Westbourne Grove has been away from the Mother Land far too long, and has forgotten what a real croque-monsieur should be like. A toasted sandwich is not a croquet-monsieur, and to be charged £5.50 (making it probably the most expensive toasty in London) only added insult to injury. 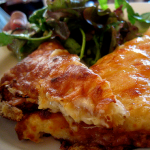 Did you try the Croque in Le Beaujolais just off the Charing X Rd? I think they are one of the best but I do agree that Cote is very good too.